Third party call monitoring, offered by Phoenix, Arizona based company Sage Advantage, provides many advantages to your call center. When you work with Sage Advantage to improve your call center’s performance, we become an extension of your quality team but bring the benefit of an objective perspective and call center expertise. When bringing in someone to do third party call monitoring, you want to ensure it will be worth the cost and the time. At Sage Advantage, we believe higher quality comes from evaluating, analyzing and engineering for success. By working to improve these key areas, you’ll find your call center performing the best customer service possible which can lead to better sales and customer retention. Sage Advantage offers a variety of evaluating tools to help improve call center performance. Call recording and call monitoring can help your agents improve their performance. Even though we do third party call monitoring, we will work with you as an extension of your quality team and help lighten the load for you when it comes to quality monitoring. Evaluation is also important. We’ll help establish measurable objectives, which can be used to evaluate your agents’ performances and the performance of your call center as a whole. Your dedicated quality team will also perform group evaluations with managers and provide them feedback and tips to help them coach call center representatives. 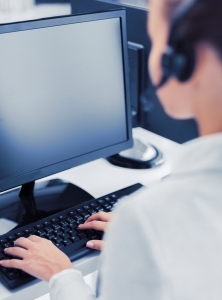 Analytics are another critical part of call centers. Offering more than just third party call center monitoring, Sage Advantage also offers Sage Analytics. This system keeps all your information in one place. Designed with you in mind, our system is easy to navigate while able to store a significant amount of data. By having easy access to analytics, you can identify issues and take quick action to correct them. Engineering for success is another benefit of using us for third party call center monitoring. We will work with you to determine your goals and lay out measurable steps to help you meet your goals. With years of experience and your own dedicated, expert team to help, we’ll work to help you lay out a plan for success. Phoenix, Arizona based Sage Advantage offers more than just third party call center monitoring. We work with you as an extension of your quality team to help ensure your call center is providing the best customer service possible to your customers. To learn more about the benefits of third party call monitoring with Sage Advantage or their other company, Evaluate Quality, be sure to give us a call. Or, schedule a free, no obligation demonstration. We would love to see what we can do for you.